IRVINE, Calif.--(BUSINESS WIRE)-- joimax® again launches new product innovations at the upcoming American Association of Neurological Surgeons (AANS) taking place in New Orleans from April 28 – May 2, and at the Global Spine Congress (GSC) in Singapore, starting May 2. 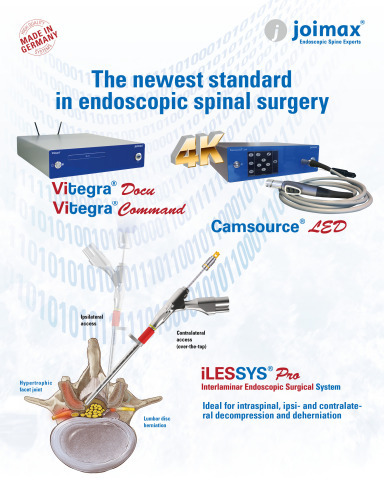 The German based market leader of technologies and training methods for minimally invasive endoscopic spinal surgery expands its family of decompression systems with an additional milestone of its interlaminar endoscopic access systems named iLESSYS® Pro for access and resection within the spinal canal. All endoscopic systems, including the members of the so-called iLESSYS® Family, will be shown at AANS as well as at GSC, where joimax® will host a full-day workshop with four stations on May 1 and with numerous lectures on endoscopic spine surgery held throughout the congress. iLESSYS® Pro was developed in collaboration with Christoph Hofstetter, MD, PhD Associate Professor at University of Washington in Seattle, Washington. It combines the ability to efficiently remove and decompress degenerative spinal pathology from the iLESSYS® Delta with the possibility to enter the spinal canal and treat intraspinal disc pathology, which has been a hallmark of the iLESSYS® system. Along with TESSYS®, TESSYS® XT and TESSYS® Isee, now all lumbal and thoracic degenerative pathologies can effectively be treated with joimax® techniques. “We have re-engineered every part of the iLESSYS® Pro, including dilators, rongeurs and drills with the goal to bring spine endoscopy one step closer to the efficiency of minimally invasive tubular spine surgery. Our patients benefit from the minimal tissue trauma associated with a small working corridor and a low complication rate achieved by superior visualization and illumination by working channel endoscopes. The new scope has completely surpassed my expectations and it is my go-to scope for interlaminar discectomies, medial facetectomies and certain laminectomies,” explains Dr. Christoph Hofstetter. At both congresses, the company will show its newest combined 4K resolution camera and LED light source system, Camsource® LED and its fully integrated documentation and command system, Vitegra® Docu and Command. They were presented for the first time at the Annual Meeting of the American Association of Orthopedic Surgeons (AAOS) in New Orleans in March. Founded in Karlsruhe, Germany, in 2001, joimax® is the leading developer and marketer of complete systems for endoscopic minimally invasive spinal surgery. With TESSYS® (transforaminal), iLESSYS® (interlaminar) and CESSYS® (cervical) for decompression procedures, MultiZYTE® (for facet and sacroiliac joint treatment) or with EndoLIF® and Percusys® for minimally-invasive endoscopic assisted stabilizations, proven endoscopic systems are provided that, together, cover a variety of indications. In procedures for herniated disc, stenosis, pain therapy or spinal stabilization treatment, surgeons utilize joimax® technologies to operate through small incisions - under local or full anesthetic - via tissue and muscle-sparing corridors through natural openings into the spinal canal (e.g. intervertebral foramen, the “Kambin triangle”).